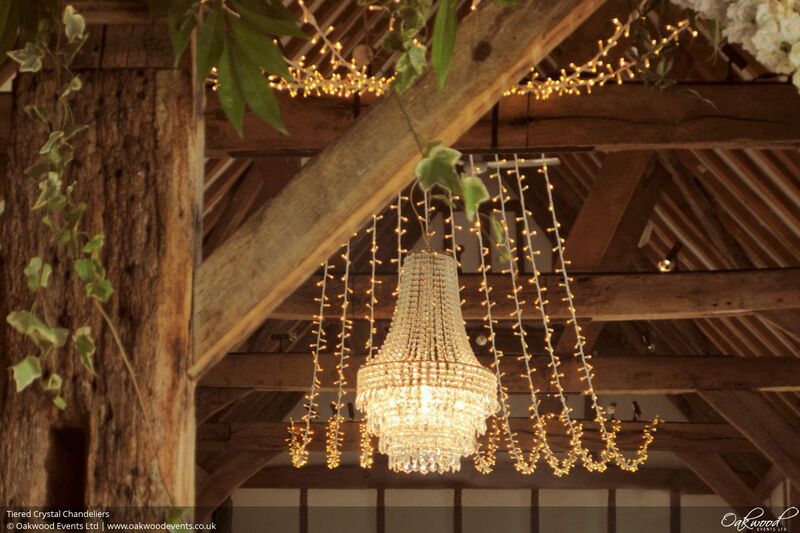 Chandeliers are the ultimate ceiling centrepiece for creating a focal point at weddings and events. For venues where there is limited lighting or when existing lighting is harsh or can't be dimmed, large dimmable chandeliers are functional as well as beautiful. For a modern twist, chandeliers can be hung in sets at varying heights, for example over a top table. 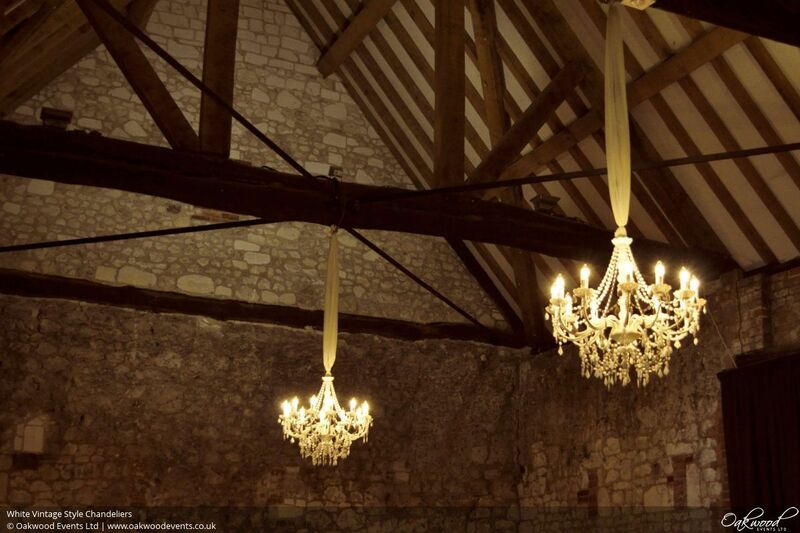 We supply chandeliers for weddings and events including all equipment hire, installation and removal. 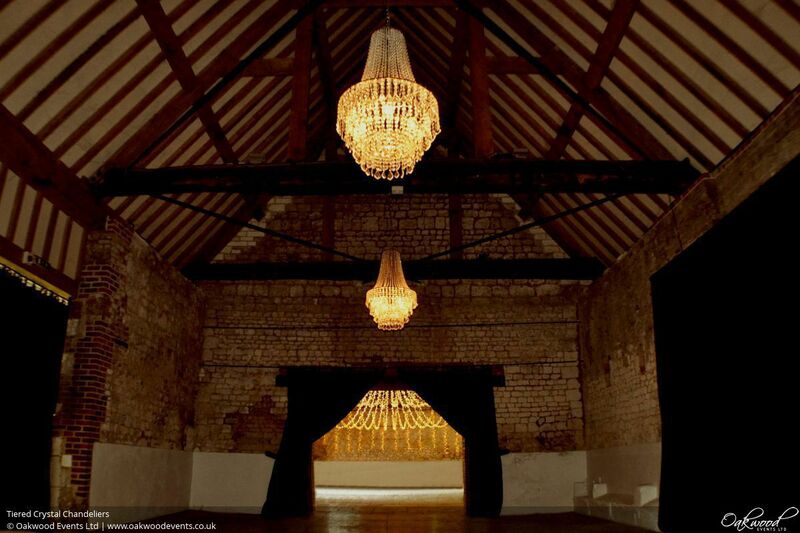 We have a range of chandeliers to suit different styles of event. Our tiered crystal waterfall chandeliers have beautiful, cascading drops arranged in four concentric rings. This style is sometimes called a "wedding cake" chandelier because the rings resemble the shape of an upside down wedding cake. 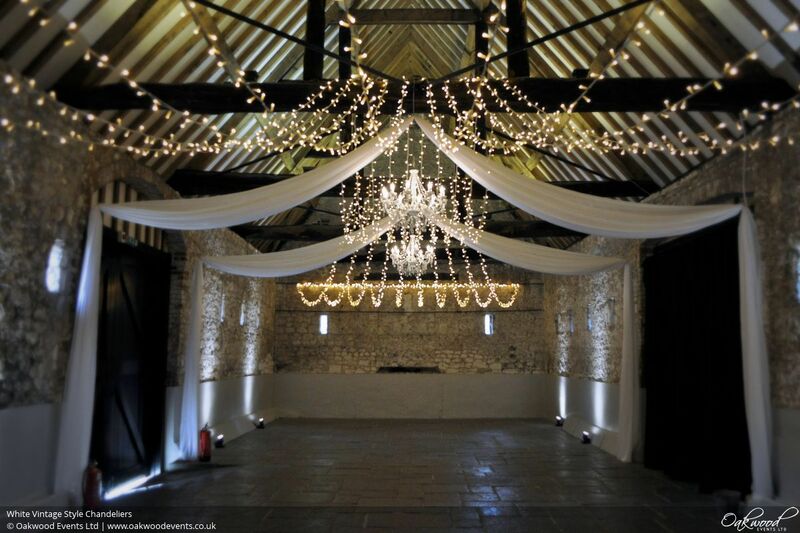 Reminiscent of the regency style they are flexible and perfect for combining with fairy lights and drapes for classically elegant events. 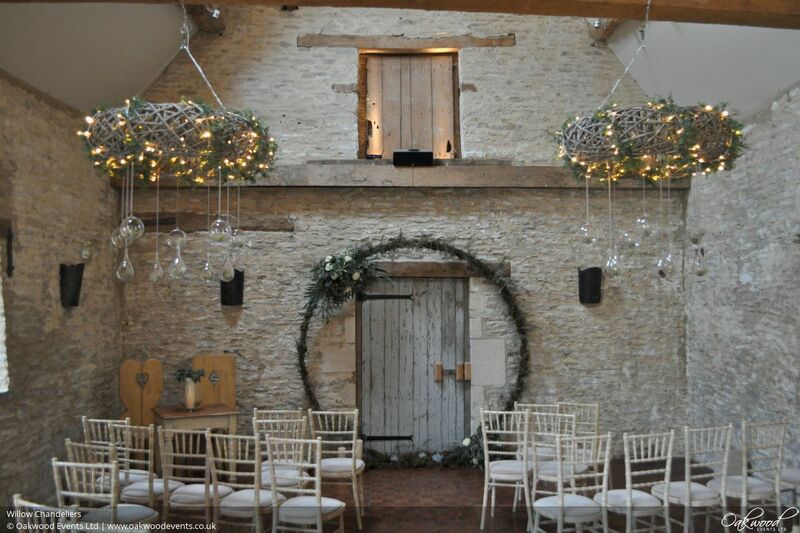 Our tiered crystal chandeliers are also great for modern weddings as the waterfall shape is often seen in comtemporary chandelier styling. Our 15 arm crystal chandeliers are made in the Marie Antoinette style, with glistening pendants, drops and lavish bobeches. 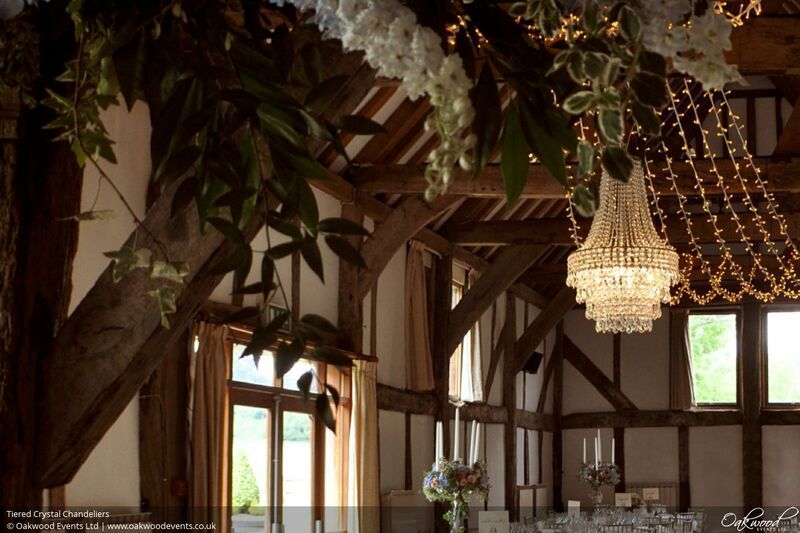 From the top flourish and canopy, garlands of crystals hang down to each arm creating a riot of sumptuous sparkle. Elegant and stylish, these chandeliers need no adornments and look stunning when dimmed for the evening as the bulbs take on a rich, golden glow. 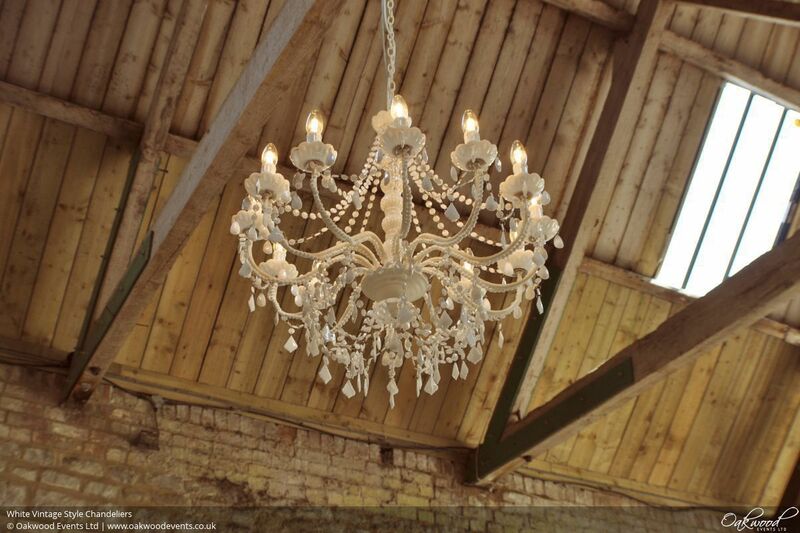 These are a real statement chandelier and would work beautifully hung in sets or with drapes. For larger spaces, we have a pair of giant 30-arm chandeliers which match the design of the 15 arm chandeliers above. These are exquisite and huge measuring 1.1m x 1.2m (height x diameter) and so are ideal for larger venues as a pair, alongside the 15-arm chandeliers, or where a single wow factor piece is needed. 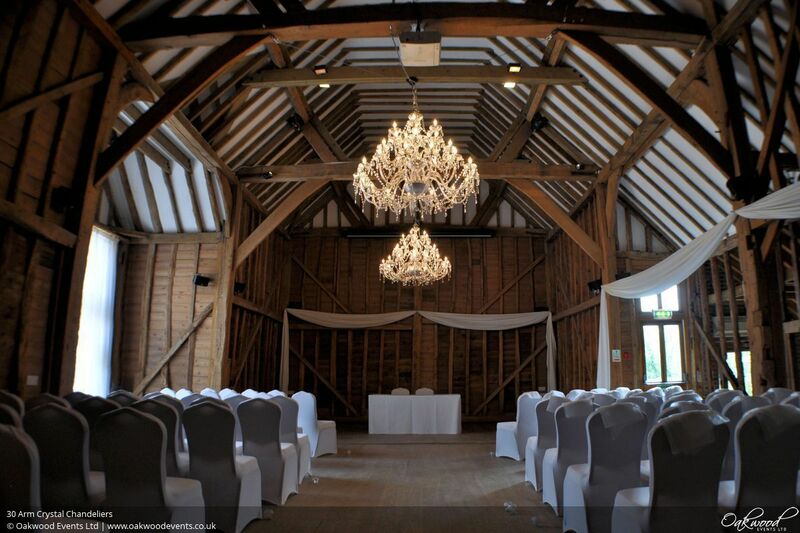 For rustic and vintage weddings our white vintage style chandeliers are perfect. 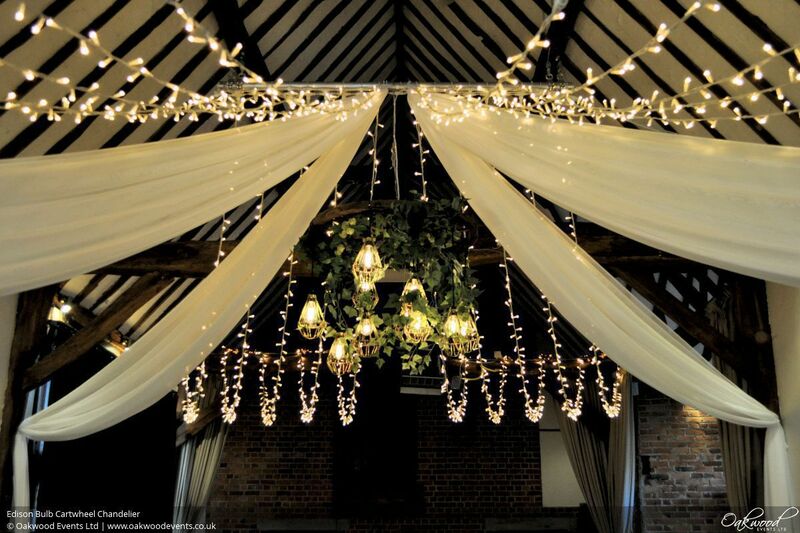 Large, pretty and adaptable, they work well with fairy lights, festoon lights, drapes and sails. They can also be supplied adorned with silk ivy for a beautiful, lush look. 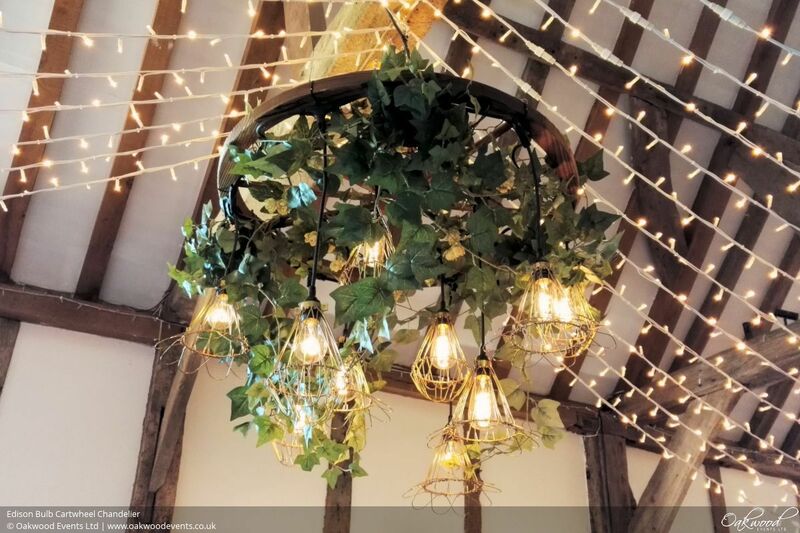 For a rustic or vintage look where chandeliers are being used for style rather than appreciable light, or where there is no access to mains electricity, we can install our ivory and white chandeliers with LED candles in place of bulbs. This design is also available in black. 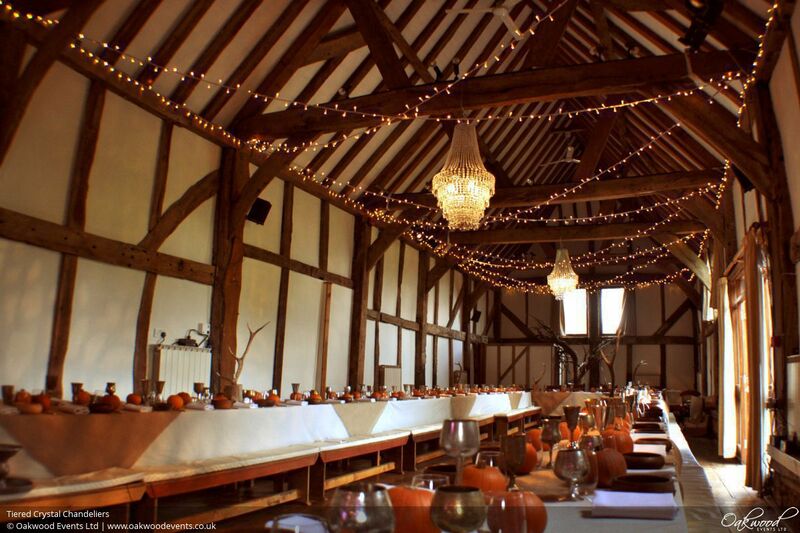 With ivy and candles they would complement a dramatic or luxe style wedding. For rustic chic, our Edison bulb chandeliers consist of a large wooden cartwheel with 10 squirrel filament Edison bulbs in mixed styles suspended underneath at varying heights. Each bulb is contained inside a gorgeous wire-frame bulb cage, and the whole chandelier is adorned with lush silk greenery. A woven ring of willow, wound with silk eucalyptus and fairy lights. 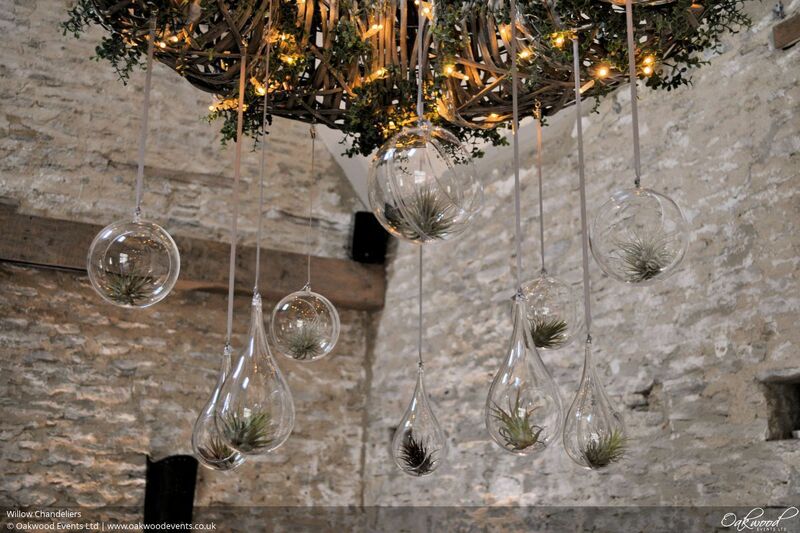 Optionally add hanging accessories such as transparent baubles containing silk flower heads. 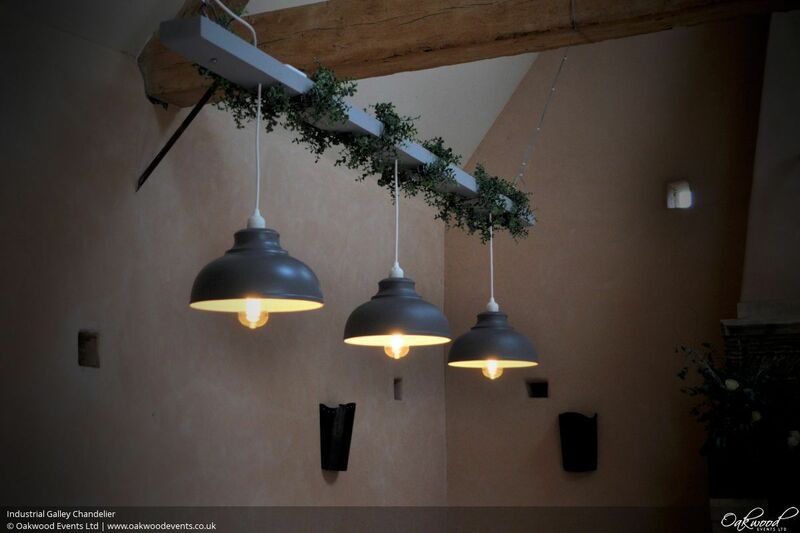 Muted grey base wound with silk eucalyptus and grey shades with bare filament Edison bulbs. 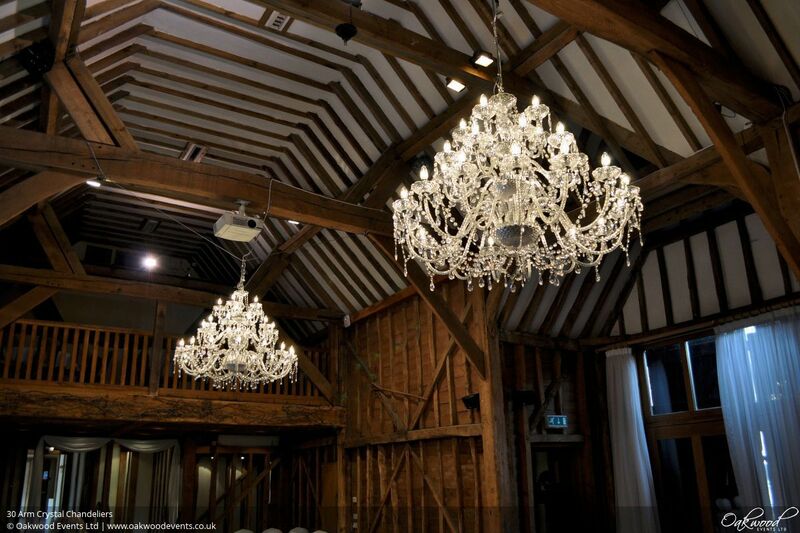 Our galley chandeliers are ideal for hanging over long tables. For something impressive and unique, our mirror ball chandeliers consist of a large empire style crystal chandelier in the tent and bag style with an integrated mirror ball inside. These are perfect for hanging over a dance floor where they are elegantly sparkly during the day and when the evening comes they transform the room at the flick of a switch with the classic glitter ball disco effect for the dancing. 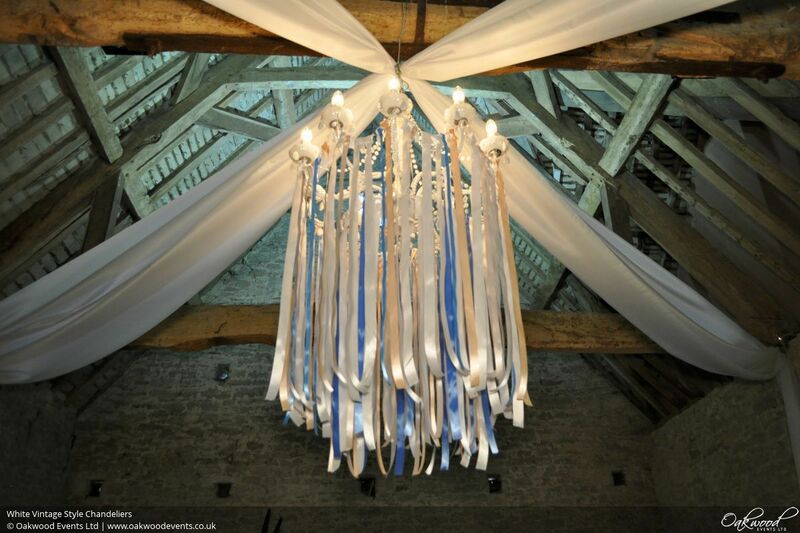 Our fully lit outdoor chandeliers are very special. 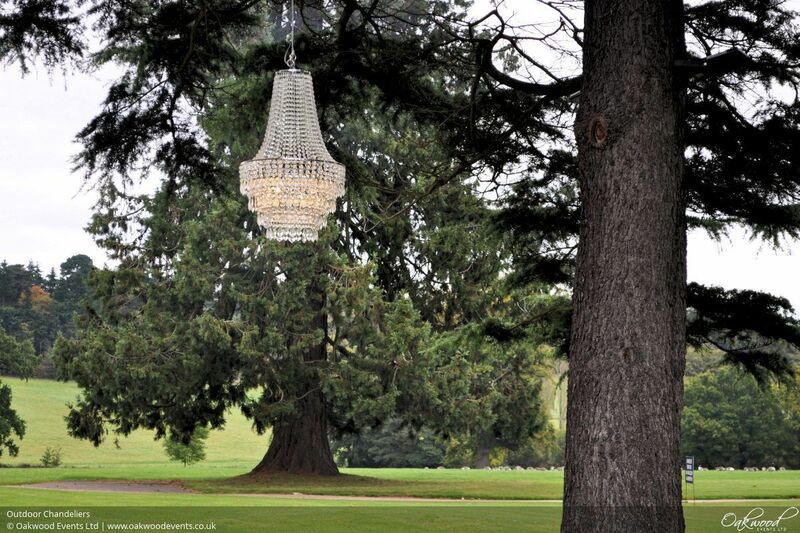 A pair of our tiered crystal chandeliers have been cleverly waterproofed and adapted to be safe for use outdoors in the unpredictable UK weather and can be used as a stunning feature, perfect for hanging from the branch of a large tree. 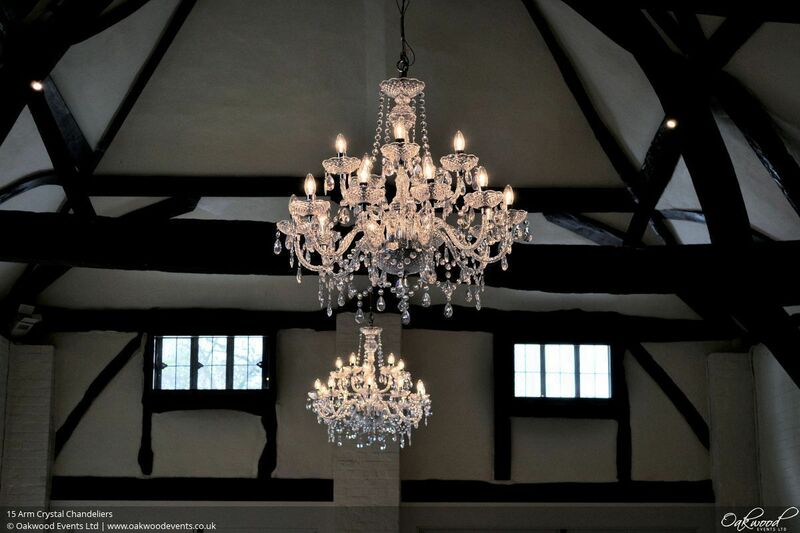 Our chandeliers use high quality acrylic crystals, making them considerably lighter than traditional glass chandeliers. The reduced weight allows us to install them quickly and efficiently without the risk of damaging or overloading the supporting structure. All of our chandeliers (except the mirror ball chandelier, which is externally lit by spot lights) are installed on dimmers so they can be bright during the day, dimming to a beautiful golden glow for the evening reception. 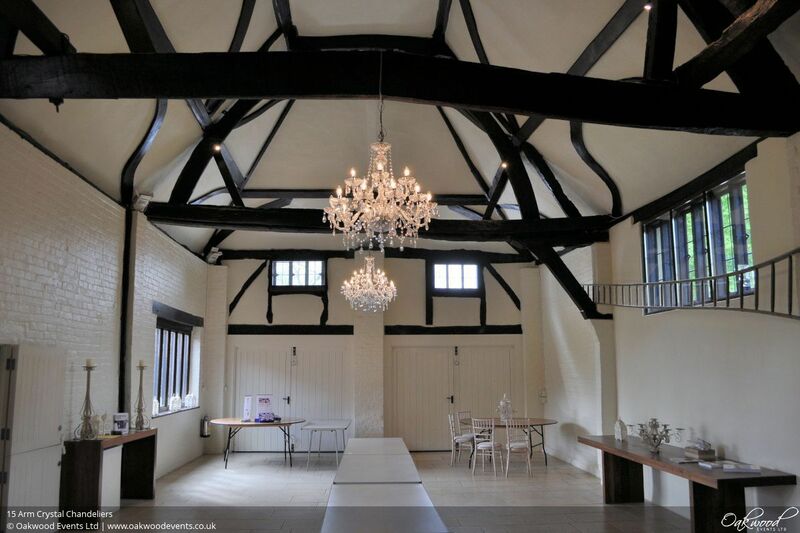 We always respect the places where we work and use temporary, non-damaging fixings to hang our chandeliers. We take care to consider power requirements and aethestics, minimising visible cabling. 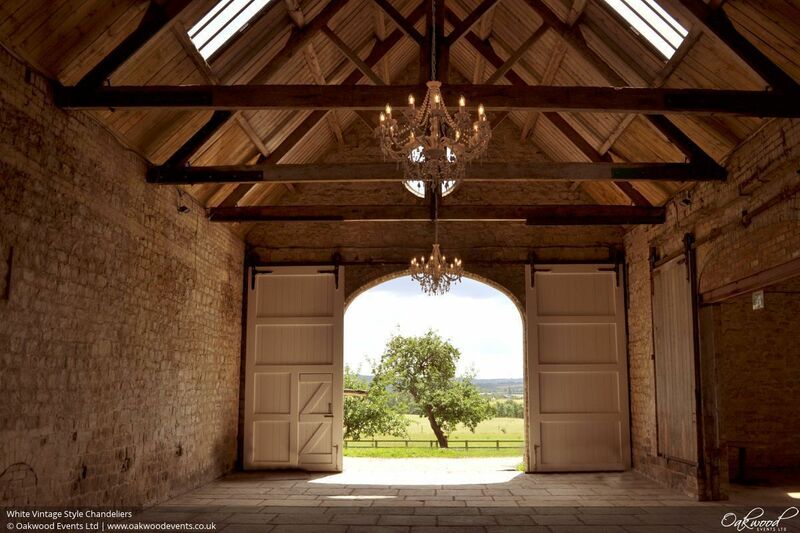 For lots more images of our chandeliers, see our chandelier Pinterest board. 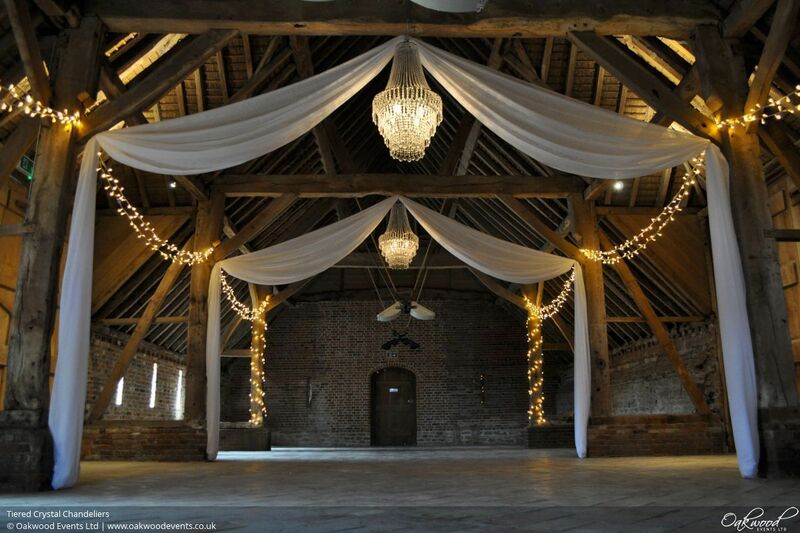 To discuss chandelier options for your event, contact us here.